(Nanowerk News) nano tech 2010 International Nanotechnology Exhibition and Conference, held for the ninth time from February 17 to February 19, 2010 ended successfully. 654 exhibitors presented the latest nano technologies and products on a total exhibition space of 7227m2. 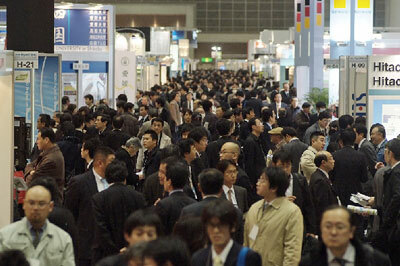 With 192 overseas exhibitors, around 30% came from one of the 19 participating foreign countries and regions. During the three exhibition days, 42,381 visitors gathered at Tokyo Big Sight to meet exhibitors for business talks and to get information on latest developments in the field. This year at nano tech, exhibitors and exhibits in the materials field received even more attention than usual. The National Institute for Materials Science (NIMS) for example announced nano-materials and technology research results on high efficiency gas turbines and fuel cell catalysts to contribute to the reduction of CO2 emissions. In addition, the nano tech executive committee newly established an “Application Category” in the nano tech Awards, as a means of recognizing products and technologies that made the way to commercial applications. The three companies of Chakyu Dyeing Co., Ltd., Kurarayliving Co., Ltd., and Matsubun Textile Co., Ltd., which exhibited for the first time at nano tech on a joint basis, were presented the inaugural Application Award for their efforts leading to the full-fledged product development and commercial sale of carbon nano-tubes. NOF Corporation was also presented with the Application Award, for its efforts in developing a groundbreaking nano-particle dispersion fluid that prevents metallic oxide nano-particles from changing properties. For the second time, nano tech and its five concurrently held exhibitions highlighted the common theme of Green Nanotechnology. This year, a total of 136 corporations and organizations exhibited relevant technologies and products. Among these, the technologies of Toray Industries Inc. attracted particular attention, as Toray has continued to engage in comprehensive efforts to reduce environmental burden. Toray was awarded this year’s “Green Nanotechnology Category Award” for the development of high performance reverse osmosis membranes for desalination and the development of carbon fiber composite materials. A Special Green Nanotechnology Symposium with eight invited speakers was filled to capacity with interested audience members and a Green Nanotechnology poster session presented the works of 23 overseas researchers from nine countries to the audience. Application for 2011 started during this year’s event. Around 80% of the space for nano tech 2011 has already been sold. Capitalizing on its comprehensive capacity as a materials manufacturer, Gunze Limited exhibited some groundbreaking products and was able to highlight dynamically the applications and “exits” for nanotechnology. These products include anti-finger mark films, multi-functional films like for color compensation, SiC composite materials with high degree of hardness and resilience to fracturing; and advanced function undergarments featuring nanofibers. NIMS has made tremendous progress in the development of the most advanced materials for high performance and function in all manner of devices used from home appliances to cell phones, up to automobiles and aircrafts. NIMS is engaged in activities to promote to a broad audience the importance of highly advanced materials, highlighting the uses for such technologies as thermoelectric generation and high-temperature super conduction. In addition, in combination with its search for new materials and materials development, NIMS is also engaged in efforts to nurture the next generation of researchers. The City of Kobe has gathered a total of 163 organizations, including corporations and universities in an effort to nurture a cutting-edge medical industry. As part of this effort, it has been decided to install a next-generation super computer in a new established research facility for computational science that will be useful for medical applications. This initiative aims not only to revive the local economy in Kobe, but also to represent Japan in nurturing a world-class, cutting-edge medical industry. Through the realization of a 125kV high acceleration voltage, Elionix Co., Ltd., has been able to create a ground-breaking ultra-high precision electron beam lithography system, which has reduced the minimum diameter of the smallest electron beam from 5nm to 1.7nm, and brought down minimum line width from 10nm to 5nm. The laser diffraction and light scattering particle analyzer BlueRaytrac responds to R&D and quality control needs in the nanotechnology sector. It features three BlueRay lasers and has greatly improved resolution capabilities in the nano and sub-micron fields. Toray Industries has been instrumental in establishing truly innovative technologies that contribute to the field of green nanotechnology. These achievements include development of high performance reverse osmosis membranes for desalination and effluent processing, weight reduction and improvement of fuel efficiency through the development of carbon fiber composite materials, and energy conservation through the development of unique heat insulation sheets (wall materials). Chakyu Dyeing Co., Ltd. / Kurarayliving Co., Ltd. / Matsubun Textile Co., Ltd. These three companies have developed a heating element using carbon nanotubes, and used this technology to test a snow-melting mat for use in cold regions. The product exhibited by this trio of companies is a ready-for-market product that uses large quantities of nanotubes and as such, the exhibit of the sample product provided an inspiration for the development of other applied products. NOF Corporation has developed a groundbreaking nano-particle dispersion fluid, which by reducing bleed-out thanks to the inclusion of a functional polymer, enables dispersion stabilization without changing the properties of metallic oxide nano-particles. Flanders Investment and Trade played a coordinating role in bringing together four organizations that are engaged in research into advanced nanotechnologies. The four organizations together covered a broad range of fields, including MEMS, bio and materials. Moreover, the grouping is engaging actively in exchange with Japan as well as advancing research that will lead to the creation of new industries. Nanotec Corporation has pioneered the development of its unique Diamond-like Carbon (DLC) technology and also its Intrinsic Carbon Film (ICF), which have contributed to various functional improvements.